One of the key aims of our Sunday School is to help the children recognise that we are all one big worshipping community, adults and children alike – so that when the children attend the 5th Sunday services in the cathedral parts of it are already familiar to them, and when adults visit Sunday school they are nourished by our liturgy. Lent has provided a good opportunity to underline this and put some changes into action. One of the children had already noticed that the gleaming gold cross we usually process behind on our way to Sunday School had been changed to the smaller and plainer wooden one, and once in the Sunday School room, all the children noticed the changes which had been made to the worshipping space: removal of some artwork from the walls; and a simplification of the altar articles (see picture) notably that the decorative ‘Magnificat’ plate had been replaced by a plain wooden dish. We had a serious discussion about about the meaning of Lent, and agreed to ways in which Sunday School would mark the main principles of Lent, namely fasting, almsgiving and prayer. Recognising that our children don’t earn money, we have decided to interpret this as ‘serving others’. Each week of Lent two children will be chosen to set up the children’s cookie and juice table at coffee hour, to serve the other children and to tidy up at the end. We are already a prayerful Sunday School, so the difference we will make is to do our prayers silently so we can listen to what God might be saying to us. We will still each place a stone on a plate and say ‘amen’ after each person does this, but during Lent we will not say our prayers out loud. Our round of silent prayers will conclude with our version of the Lord’s Prayer in sign language, and the great thing about this is that the children can say it in their heads in either French or English! 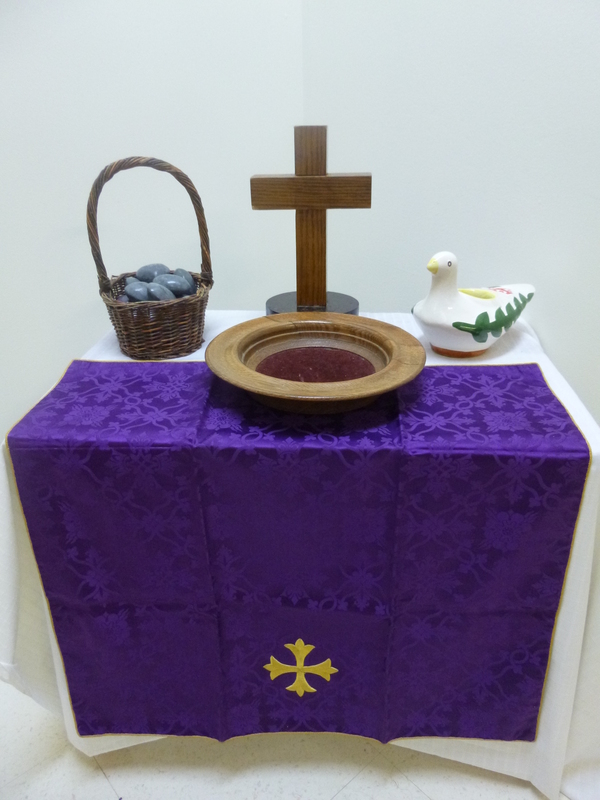 All this doesn’t mean that Sunday School is no fun during Lent – it’s just different. We are busy learning ‘The Lord of the Dance’ and making the ‘moon and the stars and the sun’ to use in a liturgical dance with the adult dance group at the Easter Day morning service. Now, that’s worth waiting for!